Harper government prepares for Native “unrest"
Fort Yuma, CALIFORNIA/ARIZONA -- Today, the NAFTA Tribunal in the Glamis Gold dispute against the United States released its long-awaited decision. The Tribunal found that the State of California's and the United States' actions in regulating hard rock mining on public lands did NOT violate provisions of NAFTA. "We were the first tribe to have our briefs accepted in a NAFTA claim dispute" stated Mike Jackson, Sr., President, Quechan Nation. "The award shows that the Tribunal understood that the Indian Pass area is a sacred area to the Quechan people, worthy of protection from hard rock mining. After battling the mining company for nearly fifteen years, it is good to have this decided. 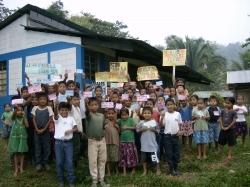 We encourage Glamis (now GoldCorp) to take immediate steps to put the matter behind all of us." 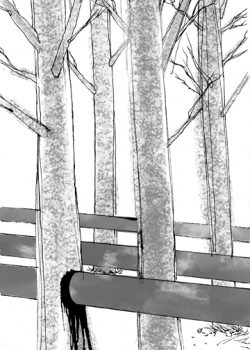 Such steps could include GoldCorp not appealing the decision and abandoning or otherwise relinquishing its mining claims so that the existing withdrawal of the area from new mining claims would absorb the area proposed for the mine. Glamis must also pay two-thirds of all proceeding costs. » continue reading "NAFTA Tribunal recognizes sacred place of Quechan Tribe – denies Glamis Gold's claim in full"
With more than a full year before the 2010 Vancouver Winter Olympics begin, the games have already encountered stiff opposition. 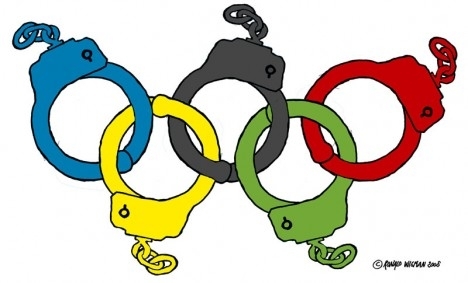 A range of groups have expressed their disagreement with the way that the Olympics are being run on Canada's west coast. Their concerns include: environmental destruction, the rights of low or no income residents, lack of transparency and consultation in decision making, and development on indigenous land that has never been surrendered to Canada. Vaughan, ON- On Thanksgiving Sunday, October 12th, 2008 roughly two dozen protesters blockaded the Canadian Pacific Rail just north of Toronto. The blockade began at 5:30 p.m. and ended just after 8:00 p.m. Winnie Small, 20, attached herself to the rails in order to delay removal by police. Alex Hundert, police liaison for the varied group of protesters, negotiated with the local police service, which was taken by surprise by the bridge blockade. The group, consisting of Anti-War @ Laurier organizers, native organizers from the Six Nations reservation by Caledonia, and various individuals, was allowed to leave the blockade without arrests or conflict. According to the police, who were in communications with CP rail on site, the blockade caused millions of dollars of economic damage and delayed trains all along the rail line. » continue reading "PHOTO: Solidarity Blockade Slows Spirit Train"
Chiefs of Ontario intervene on behalf of Barriere Lake Algonquins. NOTE: NORMAN MATCHEWAN, SPOKESPERSON FOR THE BARRIERE LAKE ALGONQUINS WAS PUBLISHED TODAY IN THE MONTREAL GAZETTE! » continue reading "Video: Algonquin Blockade Attacked by Police"
UPDATE: An Algonquin man is hospitalized the morning after Quebec police shot him in the chest with a tear-gas cannister. A disabled teenage girl was also treated with oxygen in the local Health Clinic. Twenty two children under eight and two babies were caught in the tear gas shot by the police. Kitiganik/Rapid Lake, Algonquin Territory / - Yesterday afternoon, the Conservative government and Quebec used riot police, tear gas, and "pain compliance" techniques to end a peaceful blockade erected by Algonquin families from Barriere Lake, rather than negotiate, as requested by the community. 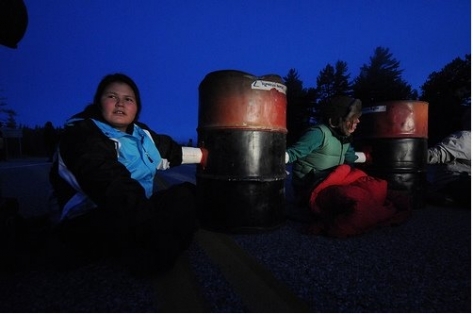 The blockade on Highway 117 in Northern Quebec began at 6:00am Monday, with nearly a hundred community members of all ages and their supporters promising to remain until Canada's Conservative government and Quebec honoured signed agreements and Barriere Lake's leadership customs. Around 4pm, nearly sixty Quebec officers and riot police encircled families after a meal and without warning launched tear gas canisters, one of which hit a child in the chest. » continue reading "Algonquins Hospitalized After Police Attack"
Kitiganik/Rapid Lake, Algonquin Territory / - Families from the Barriere Lake First Nation in Northern Quebec set up a peaceful blockade at 6:00 am this morning, promising to maintain it until Canada and Quebec respect and implement widely praised agreements, and Canada appoints an observer to witness a leadership reselection in the community, and respects its outcome. 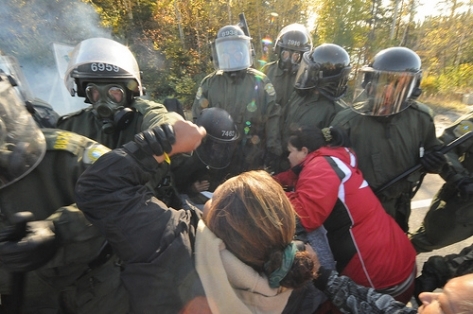 "We maintained a peaceful presence all day, but Canada and Quebec would now rather have the Quebec police arrest youth, elders and mothers, than deal in good faith with our community," said Norman Matchewan, a youth spokesperson, from the site of the blockade, as riot police from Montreal prepared to make arrests. » continue reading "Riot Police Target Barriere Lake Algonquin Blockade"
» continue reading "Highway Blockade set up by Barriere Lake Algonquins"
Kitiganik/Rapid Lake, Algonquin Territory Territoire Algonquin /- On the National Day of Political Action, at 1:30 pm, the Algonquins of Barriere Lake will slow down traffic on highway 117 to distribute flyers and raise awareness about the Conservative government's violations of their rights. "The federal government must accept reasonable demands we've spent years trying to reach them about – that the government honour agreements they've signed with us and stop undemocratically propping up an illegitimate Chief and Council in our community," says Norman Matchewan, a youth spokesperson for Barriere Lake. They want the Government of Canada to uphold an internationally lauded sustainable development agreement Barriere Lake signed with Quebec and the Conservative federal government in 1991. The Government of Canada has been in breach of the agreement since 2001. To resolve the situation, Barriere Lake is demanding that the Government of Canada send observers to witness a leadership re-selection, in accordance with Barriere Lake's Customary Governance Code, in good faith recognize the outcome, and then cease all interference in their internal affairs. This morning, the Brantford Police arrested two young activists from 6 Nations, aged 17 and 19. The two were arrested in transit while trying to leave the campsite on Fen Ridge Court. Twenty cops in 8 unmarked cars pulled over the vehicle they were travelling in, and arrested the two teenagers who are currently in jail. Activists at the site in Brantford have asked for supporters to come to the site tonight and/or tomorrow. The Hampton Inn site on Fen Ridge has been shut down completely for two weeks. It had also been shut down several times over the last few months by various representations from 6 Nations including Ruby and Floyd Montour, the Confederacy Council, the Men's Fire, and now grassroots activists including Boots Powless and a newly dubbed NYM-6 Nations. The current callout comes directly from the activists on site. The group has maintained the site beside the Hampton Inn development site in a tepee for over 60 days, upholding the declaration put forward by the Men's Fire that these sites should be shut down pending settlement of outstanding land disputes. Further, all three sites that have been targeted from the base camp have been sited as posing ecological threats; the Fen Ridge industrial development area and the Oak Park Road development site are located in an environmentally sensitive area less than a kilometre from the Grand River. A Callout for supporters to be physically on-the-ground as early as tonight has been issued from the camp. They are also asking for food and phone cards ("solo" brand). 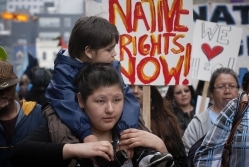 » continue reading "Six Nations Needs Urgent Support"
The past month has been a hotbed of indigenous social justice activity in Ottawa. The Algonquin community of Barriere Lake has organized and carried out several actions alongside local organizers and ally groups. 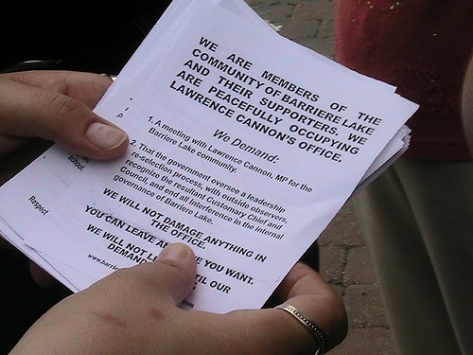 On June 26th, 2008 a dozen Algonquins and supporters occupied the office of MP Lawrence Cannon, Stephen Harper’s Quebec Lieutenant. Cannon is the also the Minister of Transportation and MP Responsible for the Pontiac Region in Quebec, in which Barriere Lake is located. The aboriginal activists and allies unfortunately could not stay, as by five in the evening they were forced to leave the office. Six were arrested, detained, and released later in the night, greeted by a crowd of cheering supporters. The chief’s promise to continue putting pressure on the minister was not in vain as on July 16th almost a hundred members of the reserve of 450 came to Ottawa for a three-day protest and camp-out. We’re here to demand the minister live up to the promise that he made to us,” said former chief Jean-Morice Matchewan. “They never kept one promise that they made to us,” he continued. 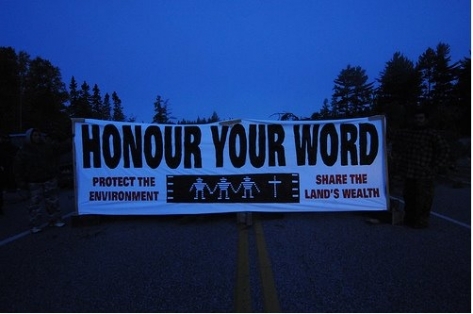 » continue reading "Algonquins Demand Justice in Ottawa"
OTTAWA-Located two hours north of Montreal, the Algonquin community of Barriere Lake came to Ottawa to protest government interference in their reserve. 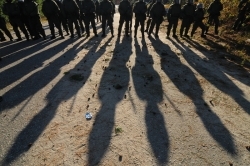 Demanding a meeting with MP Lawrence Cannon and a government-overseeing of governance reselection on their reserve, the community aims to correct a March coup d'etat carried out on their reserve. The community's Customary Chief, Benjamin Nottoway, speaks with RabbleTV about the recent events on the reserve, the governance difficulties, and the struggle to protect the land. Terry Matchewan, an Algonquin man who was part of the delegation to Ottawa was attacked alongside four other Algonquin men by Gatineau police and speaks of their targetting and wounds. » continue reading "Mohawk Grandmother Challenges Border Jurisdiction "
Prior the G8 Summit in Japan this year indigenous peoples from around the world gathered in Ainu Mosir. This is the official declaration they have prepared. 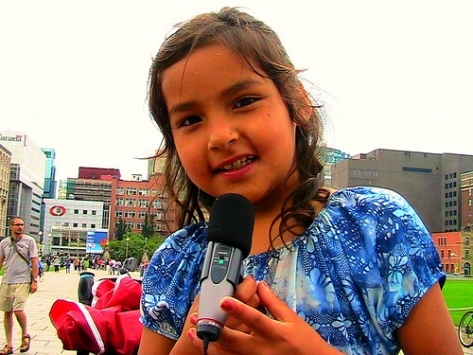 » continue reading "Indigenous Peoples' Declaration on G8 Summit"
GATINEAU- on June 26th, 2008 Algonquin representatives from Barriere Lake reserve in Quebec came to Gatineau. A protest was called outside the Northern and Indian Affairs building to demand the governemnt reverse the recent coup d'etat it imposed on the reserve. The protest turned out to be a diversion for a peaceful sit-in which took place in MP Lawrence Cannon's office in Buckingham, QC. In spite of the indigenous and solidarity activists demands to see the MP they were ignored and six members were arrested. They were released later in the night. Correction: unnamed Algonquin representative of Barriere Lake in video is former Customary Chief Jean-Maurice Matchewan, under whose leadership Canada and Quebec signed the reserve's Trilateral Agreement in 1991. After a six hour occupation of MP Lawrence Cannon's Office in Buckingham, QC, yesterday, six Algonquin activists and allies were arrested by Sûreté du Québec police officers. The arrestees were detained for four hours and were finally released at 9:30 p.m. into the arms of cheering family and friends outside the Gatineau Police Department building. Among the awaiting crowd was Customary Chief Benjamin Nottaway (seen in video) whom the government attempted to revoke from power in the Barriere Lake reserve by imposing a minority appointed government. The so called Coup D'etat was the latest in a long series of governmental interventions in the impoverished reserve and led to the office occupation which took place yesterday. Previously, the indigenous representatives attempted to raise awareness of neo-Colonial internvention in their community by camping on Parliament Hill one year ago. GATINEAU - On Thursday, June 26th, Algonquin representatives from Barriere Lake and allies assembled outside the Gatineau offices of Indian Affairs, across the river from Ottawa. The demonstration was a diversion, intended to draw attention from peaceful occupation of Lawrence Cannon's office, MP for the Barriere Lake region. 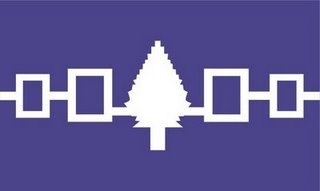 The Algonquins demanded a meeting with Cannon to discuss the recent government ousting of the Customary Chief and Council as well as a re-election monitored by outside observers. The Barriere Lake Solidarity Collective, based in Montreal, as well as Algonquin representatives from Barriere Lake itself have vowed they will not leave the office until their demands are met. They have been threatened with arrest, and are welcoming support from anyone willing or able to assemble in Buckingham, QC. 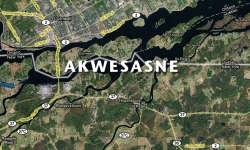 » continue reading "Barriere Lake Algonquins Occupy MP Office"
After a week of tension the police services have declared withdrawal from the Tyendinaga Mohawk Territory. Though announcing today all Ontario Provincial Police barricades are to be removed, cruisers and helicopters continue to survey the area. Satisfied with the outcome, the Mohawk defenders of the Quarry have declared victory, consequent to which all solidarity blockades at Six Nations in Caledonia have also been removed. 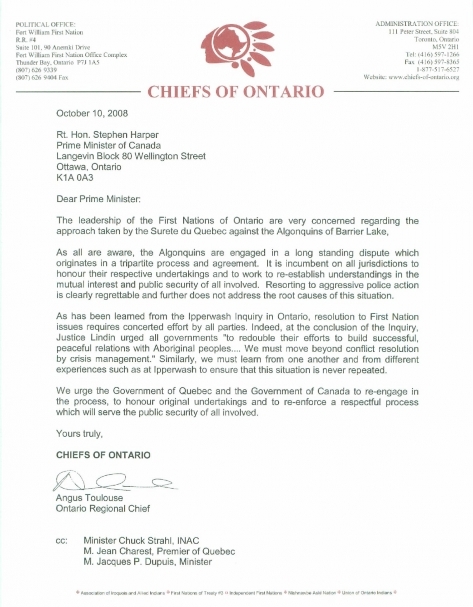 Three members of the Tyendinaga Mohawks remain in custody though two were released on Monday, April 28th, 2008. Supplies, a trailer, a barbecue, food, and some vehicles belonging to the Mohawk community have been taken by the police forces and are still not returned. 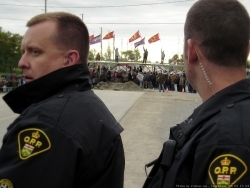 Meanwhile, non-Native allies have been assembling and delivering supplies from various Ontario cities to support the Mohawks in their struggle since Friday, April 25th, 2008. The community estimates police surveillance will continue until Thursday when the remaining detainees are scheduled to appear in court. For this purpose they are requesting monetary assistance with legal fees and will be holding various fundraisers.